I’m back again today with another meal review for you! Exciting, I know! Last week my good friend introduced me to a vegetarian curry recipe that you can find here and I decided to try it out on Friday and let you know how it went. Now I figured I would cook it exactly how the recipe said just so I could give you an accurate review but keep in mind that this meal is for a crowd and is estimated to feed eight people. This meal is said to be a good meal if you are on a budget and need to feed quite a few people or just need to get a few meals out of it. Okay, so lets get to the ingredients. To start off with I’m going to clarify a few things for you, An Aubergine is an Eggplant, A Courgette is a Zucchini and a Butternut Squash in Australia and New Zealand are actually called a Butternut Pumpkins. I made the mistake of buying a few smaller yellow squashes thinking that the supermarket didn’t have any butternut squashes later to find out that the butternut pumpkins I had been looking at buying as an alternative were actually the squashes I needed.. I was furious. I want to start off buy saying this is really the perfect meal if you want to feed a lot of people or want to eat this for a few meals while on a budget. It had cheap easy to find ingredients and if you are using the above recipe would definitely make enough for eight people. To be 100% honest, I would assume that anyone with a well stocked pantry would have atleast 50% of the ingredients. I have to buy about half and I would say the meal cost me roughly $35AUD and fed my partner and I for two meals and we still have some in the freezer for a rainy day. 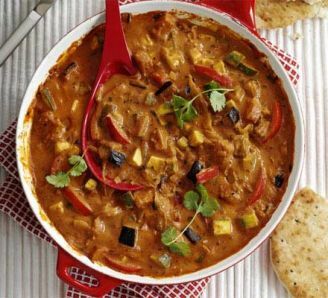 As for the method as advised buy BBC GoodFood, firstly you want to take the diced Potato, Butternut Squash (Pumpkin) and Eggplant and place them in a suitable baking dish, with two tbls Tikka Masala and to tbls of vegetable oil, mix and roast for 30mins. Meanwhile, make the sauce and boil the rice. Fry the onions in the remaining oil in a large pan until softened and golden – add a splash of water if they start to dry out. Stir in the remaining curry paste, cook for 3 mins, then add the passata, coconut milk and 100ml water. Simmer for a few mins. When the vegetables are roasted, tip them into the sauce with the peppers and Zucchini. Simmer for 10-15 mins until tender. Scatter with coriander and serve. This meal in total took about 45mins to cook, a little longer for preparation though. You can leave the veggies in the oven for a little longer than 30mins if you want them fully soft but my preference is to have them slightly more firm. Even though this was a ‘Curry’ I feel like it was just the right amount of hot for me, I can’t handle hot food too well however this meal didn’t have me reaching for my glass of milk every five seconds but you could definitely feel the heat which I think makes the perfect curry. If you love hot foods you could definitely make it hotter by using chillies instead of capsicums and using a hot Tikka Masala sauce instead of medium. I love this recipe so much for the pure reason that you can change it to so many thing, instead of the butternut pumpkin and eggplant you could just use whatever vegetables you have in your fridge at the time and that is extremely convenient. All in all I will definitely be making this meal again but I will definitely be cutting the ingredients in half so I don’t get enough to feed eight when there is only the two of us. There isn’t really anymore that I would change about the recipe, I love the flavours so much and can’t wait to make it again. Anyway guy, I hope you have enjoyed this post, I’m sorry it’s late again.. I’m rubbish at uploading on time.. However I have started the Blogilates PIIT28 Program which is a 28 day Pilates Intense Interval Training and today was my second day and I’m absolutely dying, but loving it! If I keep going with it which I really hope I do I will be reviewing it for you guys at the end of this month so keep an eye out for that! My next post to go up will be a February Favourites which I’m so excited to share with you guys! I hope you guys are having a fantastic week! Happy Hump Day! How To Make A Candle!